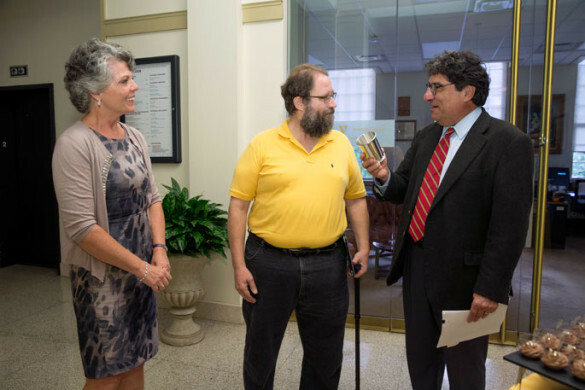 Vanderbilt Chancellor Nicholas S. Zeppos surprised psychology professor Craig A. Smith with the 2016 Chancellor’s Cup on the afternoon of Friday, Oct. 21. Smith is an associate professor of psychology and human development and a Vanderbilt Kennedy Center investigator. His research centers on the relationships among cognition, emotion and adaptation, and he has examined, among other areas of interest, the roles of emotion and coping in long-term adaptation to chronic health conditions. Smith serves as associate dean for undergraduate studies and the acting associate dean for graduate education, and has advocated for undergraduates in numerous ways, including as a Faculty VUCeptor for the freshman orientation program; and serving on the Undergraduate Honor Council Board of Advisers, the Graduate School Faculty Council and many other committees. Established by the Nashville Vanderbilt Club in 1963, the Chancellor’s Cup is presented by the president of the Club and the Chancellor during Homecoming week each fall. The award consists of a cash prize, an engraved pewter cup as a permanent trophy, and one year’s custody of a silver Tiffany and Co. bowl bearing the names of all prior recipients.